More information and to Register click on below link. The MOAA Council of Chapters Meeting will be on the 27th from 1200 – 1500 in the Sierra Blanca room @ Santa Ana Casino Hotel. Thank you to all the dedicated members who made this Award possible. To be recognized as the leading Military Service Organization in central New Mexico, supporting and giving a voice to military retirees, surviving spouse, and veterans of all services. To Provide Aid and Support to members of the uniformed services, their dependents, and surviving family members by growing our Chapter. To Represent the interests of and provide a voice for Retired, former, Active Duty, National Guard, and Reserve service members at all political levels (Municipal, County, State, and Nation). To Provide deserving Military, ROTC, and Veterans Service Organizations with financial and non-financial aid. To Educate our members and the community at large on important developments in National Security. To Support New Mexico Veterans Memorials and Monuments. To Provide chapter members the opportunity to travel and ski at a reasonable cost. 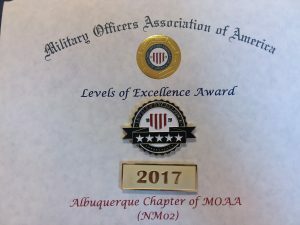 DISCLAIMER: MOAA Albuquerque Chapter is a member of the nation’s largest and most influential association of military officers. It is an independent, nonprofit, politically nonpartisan organization. Why Join the Albuquerque Chapter of MOAA? (1) You will receive every issue of the award winning chapter Albumoaa newsletter, so you can stay abreast of what is happening locally. (2) You will feel the pride in your local 501(c)(3) Chapter’s Charitable Giving Program, which includes giving ROTC Awards and contributing to the Blue Star Mothers, Gold Star Mothers, VA Hospital, High School JROTC programs, Honor Flight and more. (3) You will be supporting the Chapter’s Legislative lobbying efforts for New Mexico income tax relief for military retiree pensions and more. (4) If you chose, you can be placed on an E-mail list to receive the latest National Legislative activity news effecting you and your family – with information of what action you can take to help. (5) You will be able to participate in our Breakfast, Tours and Ski Club activities. (6) You will join in the fun when the Chapter has its annual Membership Appreciation Party. (7) You will meet and enjoy some of the finest and friendliest people in the country and have the comradeship of associating with people with interests like yours. We want all veterans, not just retired officers, and patriots who are interested in our programs to become active in our chapter. For an ABQ Chapter, MOAA Membership Application, click Join (at the top) & Submit or click on this link: Join ABQ Chapter and mail in your application today. The current year’s Membership is FREE for Regular & Surviving Spouses, if you check the box expressing your willingness to receive the newsletter only electronically. • Children, grandchildren and great grandchildren – natural and adopted, of current dues-paying members, Regular and Auxiliary – who have belonged to our Chapter for at least two (2) years. What are the considerations for selection? Click on College Scholarship (left-hand column) for application. You must be logged in as a Chapter Member (bottom, left-hand column) to have access to this information. Several years ago, Congress enacted the “Post 9-11 Veterans Educational Assistance Act,” which provides financial assistance to those the tens of thousands who leave the military services and seek college educations on their road to future success. This generous program offers qualifying veterans up to 36 months of almost fully paid college tuition, housing allowances, book, and fees—a total of $52,000 per veteran. New Mexico needs to provide incentives to encourage many former service men and women to come to our state for their education, bringing with them the Federal funded stipends that will be spent in New Mexico, producing badly needed economic development and increased tax revenues. An income tax exemption should be granted to recently separated military men and women who are enrolled in our colleges and universities. Similarly, New Mexico could attract many more of the total 60,000 military people who retire each year by granting income tax exemptions to entice them to come to New Mexico to begin a second career. They are mature, patriotic, and law-abiding citizens who bring talent and a tradition of hard work to our state. Retirees in particular bring Federal funded retired pay to enhance economic development and add to tax revenues. Many start new businesses. Additionally, they impose no burdens on any state benefits programs, since they have health services as a part of their retirement benefits. Retirees’ widows or widowers should likewise be encouraged to stay in New Mexico by extending such exemptions to their Survival Benefit Program and other Federal earnings. To All Albuquerque Chapter Members – Volunteers Needed! Your MOAA Chapter has supported the New Mexico Veterans Memorial in many ways over the years. One of the volunteer services that members have performed is to act as Greeters, staffing the front desk at the Memorial on the first Monday of each month and the fifth Thursday of each month that has five Thursdays. The times are from 9am until noon, and noon until 3pm. Please contact Clint Whisonant at Home 505-299-4836 and Cell 505- 410-1417 or email: clintwhiz@hotmail.com.